These highlights do not include all the information needed to use MESALAMINE DELAYED-RELEASE TABLETS safely and effectively. See full prescribing information for MESALAMINE DELAYED-RELEASE TABLETS. Swallow whole; do not cut, break or chew the tablets. Recommended dosage is 1600 mg (two 800 mg tablets) three times daily for 6 weeks. Known or suspected hypersensitivity to salicylates or aminosalicylates or to any of the ingredients of Mesalamine delayed-release tablets (4, 5.3). Mesalamine delayed-release tablets is indicated for the treatment of moderately active ulcerative colitis in adults. Safety and effectiveness of Mesalamine delayed-release tablets beyond 6 weeks have not been established. Do not substitute one Mesalamine delayed-release 800 tablet for two mesalamine delayed-release 400 mg oral products [see Clinical Pharmacology (12.3)]. Evaluate renal function prior to initiation of Mesalamine delayed-release tablets. Take Mesalamine delayed-release tablets on an empty stomach, at least 1 hour before and 2 hours after a meal [see Clinical Pharmacology (12.3)] . Swallow Mesalamine delayed-release tablets whole. Do not cut, break or chew the tablets. Intact, partially intact, and/or tablet shells have been reported in the stool; Instruct patients to contact their physician if this occurs repeatedly. Protect Mesalamine delayed-release tablets from moisture. For the treatment of moderately active ulcerative colitis, the recommended dosage of Mesalamine delayed-release tablets in adults is 1600 mg (two 800 mg tablets) three times daily (total daily dosage of 4.8 grams) for a duration of 6 weeks. Mesalamine delayed-release tablets: 800 mg (red-brown, capsule-shaped and imprinted with "WC 800" in black). 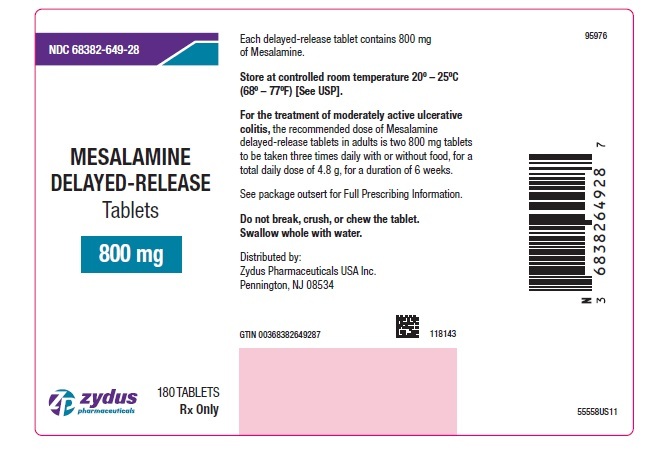 Mesalamine delayed-release tablets is contraindicated in patients with known or suspected hypersensitivity to salicylates or aminosalicylates or to any of the ingredients of Mesalamine delayed-release tablets [see Warnings and Precautions (5.3), Adverse Reactions (6.2), and Description (11)]. Renal impairment, including minimal change nephropathy, acute and chronic interstitial nephritis, and, rarely, renal failure, has been reported in patients taking products such as Mesalamine delayed-release tablets that contain or are converted to mesalamine [see Adverse Reactions (6.2)]. Evaluate renal function prior to initiation of Mesalamine delayed-release tablets and periodically while on therapy. Evaluate the risks and benefits of using Mesalamine delayed-release tablets in patients with known renal impairment or history of renal disease or taking concomitant nephrotoxic drugs [see Drug Interactions (7.1), Use in Specific Populations (8.6) and Nonclinical Toxicology (13.2)]. Mesalamine has been associated with an acute intolerance syndrome that may be difficult to distinguish from an exacerbation of ulcerative colitis. Exacerbation of the symptoms of colitis has been reported in 2.3% of Mesalamine delayed-release tablets-treated patients in controlled clinical trials. This acute reaction, characterized by cramping, abdominal pain, bloody diarrhea, and occasionally by fever, headache, malaise, pruritus, rash, and conjunctivitis, has been reported after the initiation of Mesalamine delayed-release tablets as well as other mesalamine products. Symptoms usually abate when Mesalamine delayed-release tablets are discontinued. Hypersensitivity reactions have been reported in patients taking sulfasalazine. Some patients may have a similar reaction to Mesalamine delayed-release tablets or to other compounds that contain or are converted to mesalamine. As with sulfasalazine, mesalamine-induced hypersensitivity reactions may present as internal organ involvement, including myocarditis, pericarditis, nephritis, hepatitis, pneumonitis, and hematologic abnormalities. Evaluate patients immediately if signs or symptoms of a hypersensitivity reaction are present. Discontinue Mesalamine delayed-release if an alternative etiology for the signs or symptoms cannot be established. There have been reports of hepatic failure in patients with pre-existing liver disease who have been administered mesalamine. Caution should be exercised when administering Mesalamine delayed-release tablets to patients with liver impairment. Mesalamine delayed-release tablets has been evaluated in 896 patients with ulcerative colitis in controlled studies. Three six- week, active-controlled studies were conducted comparing Mesalamine delayed-release tablets 4.8 grams per day with mesalamine-delayed release tablets 2.4 grams per day in patients with mildly to moderately active ulcerative colitis. In these studies, 727 patients were dosed with Mesalamine delayed-release tablets and 732 patients were dosed with mesalamine delayed-release tablets. The most common reactions reported in the Mesalamine delayed-release tablets group were headache (4.7%), nausea (2.8%), nasopharyngitis (2.5%), abdominal pain (2.3%), diarrhea (1.7%), and dyspepsia (1.7%); Table 1 enumerates adverse reactions that occurred in the three studies. The most common reactions in patients with moderately active ulcerative colitis (602 patients dosed with Mesalamine delayed-release tablets and 618 patients dosed with mesalamine delayed-release 400 mg) were the same as all treated patients. Serious adverse reactions occurred in 0.8% of patients in the Mesalamine delayed-release tablets group and in 1.8% of patients in the mesalamine delayed-release tablet comparator group. The majority involved the gastrointestinal system. *One Mesalamine delayed-release 800 mg tablet cannot be substituted for two Asacol 400 mg tablets [see Clinical Pharmacology (12.3)]. mesalamine. Because these reactions are reported voluntarily from a population of uncertain size, it is not always possible to reliably estimate their frequency or establish a causal relationship to drug exposure. Body as a Whole: Facial edema, edema, peripheral edema, asthenia, chills, infection, malaise, pain, neck pain, chest pain, back pain, abdominal enlargement, lupus-like syndrome, drug fever (rare). Cardiovascular: Pericarditis (rare) and myocarditis (rare) [see Warnings and Precautions (5.3)], pericardial effusion, vasodilation, migraine. Hepatic: There have been rare reports of hepatotoxicity, including jaundice, cholestatic jaundice, hepatitis, and possible hepatocellular damage including liver necrosis and liver failure. Some of these cases were fatal. Asymptomatic elevations of liver enzymes which usually resolve during continued use or with discontinuation of the drug have also been reported. One case of Kawasaki-like syndrome, that included changes in liver enzymes, was also reported [see Warnings and Precautions (5.4)]. Hematologic: Agranulocytosis (rare), aplastic anemia (rare), anemia, thrombocytopenia, leukopenia, eosinophilia, lymphadenopathy. Musculoskeletal: Gout, rheumatoid arthritis, arthritis, arthralgia, joint disorder, myalgia, hypertonia. Neurological/Psychiatric: Anxiety, depression, somnolence, insomnia, nervousness, confusion, emotional lability, dizziness, vertigo, tremor, paresthesia, hyperesthesia, peripheral neuropathy (rare), Guillain-Barre syndrome (rare), and transverse myelitis (rare). Respiratory/Pulmonary: Sinusitis, rhinitis, pharyngitis, asthma exacerbation, pleuritis, bronchitis, eosinophilic pneumonia, interstitial pneumonitis. Skin: Alopecia, psoriasis (rare), pyoderma gangrenosum (rare), erythema nodosum, acne, dry skin, sweating, pruritus, urticaria, rash. Special Senses: Ear pain, tinnitus, ear congestion, ear disorder, conjunctivitis, eye pain, blurred vision, vision abnormality, taste perversion. Renal/Urogenital: Renal failure (rare), interstitial nephritis, minimal change nephropathy [see Warnings and Precautions (5.1)], dysuria, urinary frequency and urgency, hematuria, epididymitis, decreased libido, dysmenorrhea, menorrhagia. The concurrent use of mesalamine with known nephrotoxic agents, including nonsteroidal anti- inflammatory drugs (NSAIDs) may increase the risk of nephrotoxicity. Monitor patients taking nephrotoxic drugs for changes in renal function and mesalamine-related adverse reactions [seeWarnings and Precautions (5.1)]. The concurrent use of mesalamine with azathioprine or 6-mercaptopurine may increase the risk for blood disorders. If concomitant use of Mesalamine delayed-release tablets and azathioprineor 6-mercaptopurine cannot be avoided, monitor blood tests, including complete blood cell counts and platelet counts. Limited published data on mesalamine use in pregnant women are insufficient to inform a drug-associated risk. No fetal harm was observed in animal reproduction studies of mesalamine in rats and rabbits at oral doses approximately 0.97 times (rat) and 1.95 times (rabbit) the recommended human dose [see Data]. Reproduction studies with mesalamine were performed during organogenesis in rats and rabbits at oral doses up to 480 mg/kg/day. There was no evidence of harm to the fetus. These mesalamine doses were about 0.97 times (rat) and 1.95 times (rabbit) the recommended human dose of 4.8 grams per day, based on body surface area. Mesalamine and its N-acetyl metabolite are present in human milk in undetectable to small amounts [see Data]. There are limited reports of diarrhea in breastfed infants. There is no information on the effects of the drug on milk production. The developmental and health benefits of breastfeeding should be considered along with the mother's clinical need for Mesalamine delayed-release tablets and any potential adverse effects on the breastfed infant from the drug or from the underlying maternal condition. Monitor breastfed infants for diarrhea. In published lactation studies, maternal mesalamine doses from various oral and rectal formulations and products ranged from 500 mg to 3 g daily. The concentration of mesalamine in milk ranged from non-detectable to 0.11 mg/L. The concentration of the N-acetyl-5-aminosalicylic acid metabolite ranged from 5 to 18.1 mg/L. Based on these concentrations, estimated infant daily dosages for an exclusively breastfed infant are 0 to 0.017 mg/kg/day of mesalamine and 0.75 to 2.72 mg/kg/day of N-acetyl-5-aminosalicylic acid. Safety and effectiveness of Mesalamine delayed-release tablets in pediatric patients have not been established. See the prescribing information for other approved mesalamine products for the safety and effectiveness of these products in pediatric patients. In general, the greater frequency of decreased hepatic, renal, or cardiac function, and of concomitant disease or other drug therapy in elderly patients should be considered when prescribing Mesalamine delayed-release tablets [see Use in Specific Populations (8.6)]. Mesalamine is known to be substantially excreted by the kidney, and the risk of adverse reactions may be greater in patients with impaired renal function. Evaluate renal function in all patients prior to initiation and periodically while on Mesalamine delayed-release tablets therapy. Monitor patients with known renal impairment or history of renal disease or taking nephrotoxic drugs for decreased renal function and mesalamine-related adverse reactions [see Warnings and Precautions (5.1), Drug Interactions (7.1) and Adverse Reactions (6.2)]. There is no specific antidote for mesalamine overdose and treatment for suspected acute severe toxicity with Mesalamine delayed-release tablets should be symptomatic and supportive. This may include prevention of further gastrointestinal tract absorption, correction of fluid electrolyte imbalance, and maintenance of adequate renal function. Mesalamine delayed-release tablets is a pH dependent delayed-release product and this factor should be considered when treating a suspected overdose. Single oral doses of 5000 mg/kg mesalamine suspension in mice (approximately 4.2 times the recommended human dose of Mesalamine delayed-release tablets based on body surface area), 4595 mg/kg in rats (approximately 7.8 times the recommended human dose of Mesalamine delayed-release tablets based on body surface area) and 3000 mg/kg in cynomolgus monkeys (approximately 10 times the recommended human dose of Mesalamine delayed-release tablets based on body surface area) were lethal. Inactive Ingredients: Each tablet contains colloidal silicon dioxide, dibutyl sebacate, edible black ink, ferric oxide red, ferric oxide yellow, lactose monohydrate, magnesium stearate, methacrylic acid and methyl methacrylate copolymer (1:2) (Eudragit S), methacrylic acid and methyl methacrylate copolymer (1:1) (Eudragit L), polyethylene glycol, povidone, sodium starch glycolate, and talc. The mechanism of action of mesalamine is unknown, but appears to be topical rather than systemic. Mucosal production of arachidonic acid metabolites, both through the cyclooxygenase pathways, that is, prostanoids, and through the lipoxygenase pathways, that is, leukotrienes and hydroxyeicosatetraenoic acids, is increased in patients with chronic inflammatory bowel disease, and it is possible that mesalamine diminishes inflammation by blocking cyclooxygenase and inhibiting prostaglandin production in the colon. Plasma concentrations of mesalamine (5-aminosalicylic acid; 5-ASA) and its metabolite, N-acetyl-5- aminosalicylic acid (N-Ac-5-ASA) are highly variable following administration of Mesalamine delayed-release tablets. Following single dose oral administration of Mesalamine delayed-release 800 mg tablet in healthy subjects (N = 139) under fasted conditions, the mean Cmax, AUC8-48h and AUC0-tldc values were 208 ng/mL, 2296 ng.h/mL, and 2533 ng.h/mL, respectively. The median [range] Tmax for mesalamine following administration of Mesalamine delayed-release 800 mg tablet was approximately 24 hours [4 to 72 hours], reflecting the delayed-release characteristics of the formulation. Based on cumulative urinary recovery of mesalamine and N-Ac-5-ASA from single dose studies in healthy subjects, approximately 20% of the orally administered mesalamine in Mesalamine delayed-release tablets is systemically absorbed. Food Effect: A high calorie (800 to 1000 calories), high fat (approximately 50 % of total caloric content) meal increased mesalamine Cmax by 2.4-fold and mesalamine systemic exposure (AUC8-48 and AUC0-tldc) by 2.8-fold; the median lag-time increased by 8 hours and median tmax by 6 hours (from 24 to 30 hours) [see Dosage and Administration (2.1)]. Comparative exposure between one Mesalamine delayed-release 800 mg tablet and two mesalamine delayed-release 400 mg oral products is unknown [see Dosage and Administration (2.1)]. The absorbed mesalamine is acetylated in the gut mucosal wall and by the liver to N-Ac-5-ASA. Absorbed mesalamine is excreted mainly by the kidneys asN-acetyl-5-aminosalicylic acid. Unabsorbed mesalamine is excreted in feces. Dietary mesalamine was not carcinogenic in rats at doses as high as 480 mg/kg/day, or in mice at 2000 mg/kg/day. These doses are approximately 0.97 and 2.0 times the 4.8 grams per day Mesalamine delayed-release tablet dose (based on body surface area). Mesalamine was not genotoxic in the Ames test, the Chinese hamster ovary cell chromosomal aberration assay, and the mouse micronucleus test. Mesalamine, at oral doses up to 480 mg/kg/day (about 0.97 times the recommended human treatment dose based on body surface area), was found to have no effect on fertility or reproductive performance of male and female rats. Mesalamine causes renal papillary necrosis in rats at single doses of approximately 750 mg/kg to 1000 mg/kg (1.5 to 2.0 times the recommended human dose). Doses of 170 and 360 mg/kg/day (about 0.3 and 0.73 times the recommended human dose) given to rats for six months produced papillary necrosis, papillary edema, tubular degeneration, tubular mineralization, and urothelial hyperplasia. In mice, oral doses of 4000 mg/kg/day (approximately 4.1 times the recommended human dose) for three months produced tubular nephrosis, multifocal/diffuse tubulo-interstitial inflammation, and multifocal/diffuse papillary necrosis. In dogs, single doses of 6000 mg (approximately 6.25 times the recommended human dose) of delayed- release mesalamine tablets resulted in renal papillary necrosis but were not fatal. Renal changes have occurred in dogs given chronic administration of mesalamine at doses of 80 mg/kg/day (0.5 times the recommended human dose). (PGA) score of 2; the PGA is a four-point scale (0 to 3) that encompasses the clinical assessments of rectal bleeding, stool frequency, and sigmoidoscopy findings. Patients were randomized 1:1 to the Mesalamine delayed-release tablets 4.8 grams per day group (two Mesalamine delayed-release tablets three times a day) or the mesalamine delayed-release 2.4 grams per day group (two mesalamine delayed-release 400 mg tablets three times a day). population was primarily Caucasian (97%), had a mean age of 43 years (8% aged 65 years or older), and included slightly more males (56%) than females (44%). The primary endpoint was treatment success defined as improvement from baseline to Week 6 based on the PGA. Treatment success rates were similar in the two groups: 70% in the Mesalamine delayed-release tablets group and 66% in the Asacol group (difference: 5%; 95% CI: [-1.9%, 11.2%]). A second controlled study supported the efficacy of Mesalamine delayed-release tablets at 4.8 grams per day. Treatment success was 72% in patients with moderately active UC treated with Mesalamine delayed-release tablets. Mesalamine delayed-release tablets are available as red-brown, capsule-shaped tablets containing 800 mg mesalamine and imprinted with "WC 800" in black. Protect from moisture. Tablets can be dispensed without desiccant for up to 6 weeks. Inform patients that if they are switching from a previous oral mesalamine therapy to Mesalamine delayed-release tablets to discontinue their previous oral mesalamine therapy and follow the dosing instructions for Mesalamine delayed-release tablets. One Mesalamine delayed-release 800 mg tablet is not substitutable for two mesalamine delayed-release 400 mg oral products. Inform patients to take Mesalamine delayed-release tablets on an empty stomach, at least 1 hour before and 2 hours after a meal. Instruct patients to swallow the Mesalamine delayed-release tablets whole, taking care not to break, cut, or chew the tablets, because the coating is an important part of the delayed-release formulation. Inform patients that intact, partially intact, and/or tablet shells have been reported in the stool. Instruct patients to contact their physician if this occurs repeatedly. Instruct patients to protect Mesalamine delayed-release tablets from moisture. Inform patients that Mesalamine delayed-release tablets may decrease their renal function, especially if they have known renal impairment or are taking nephrotoxic drugs, and periodic monitoring of renal function will be performed while they are on therapy. Advise patients to complete all blood tests ordered by their physician [see Warnings and Precautions (5.1)]. Instruct patients to report to their physician if they experience new or worsening symptoms of cramping, abdominal pain, bloody diarrhea, and sometimes fever, headache, and rash [see Warnings and Precautions (5.2)] . Inform patients of the signs and symptoms of hypersensitivity reactions, and advise them seek immediate medical care should signs and symptoms occur [see Warnings and Precautions (5.3)] . Inform patients with known liver disease of the signs and symptoms of worsening liver function and advise them to report to their physician if they experience such signs or symptoms [see Warnings and Precautions (5.4)]. Inform elderly patients and those taking azathioprine or 6-mercaptopurine of the risk for blood disorders and the need for periodic monitoring of complete blood cell counts and platelet counts while on therapy. Advise patients to complete all blood tests ordered by their physician [see Drug Interactions (7.2), Use in Specific Populations (8.5)] . to Allergan Pharmaceuticals International Limited.